in Naha city, Okinawa prefecture, Japan. 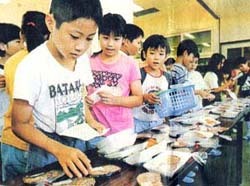 On October 16th 1999, the project team led by Okinawa Citizen's Recycle Movement hold a special class at Johoku elementary school in Naha city under the theme of Our Lives and Global Environment. The class began with a shopping game in which 32 students of 5th grade at the school participated. 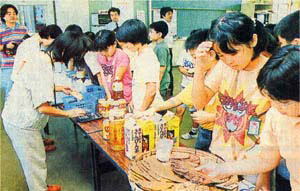 Given the improvised role of making dishes, curry and rice, they were divided into 8 groups of 4 students, and each group went shopping with a memo of the recipe to get ingredients and beverages at an imitation shop set up in the classroom. Each group was given mock money of 1,500 yen and competed with each other in how much money they left after shopping. The students discussed what they were going to buy. At the shop, there were a lot of fabricated food made by cardboard, such as meat, vegetables and seafood. However, the ways of packaging were different. Some were on sale without any wrapping , some were on a plastic food tray, some were in a plastic bag, and some were wrapped in cellophane. There were two kinds of cellophane. One included vinyl chloride and other was made of polyethylene. But students did not notice the difference at this stage. The shop were also selling three kinds of packaged beverages, namely, canned drink, PET bottled, and cartons of drink. The students had a talk with each other and enjoyed shopping. This is cheap. It's discounted 100yen. No, one is cheaper. A group was in particular considering the price of items. Other group were carefully choosing what to buy. Which is better, a PET bottle or a carton? one of them said. Why don't we look through all items and then decide? another student responded. Some students tried to remember the shopping with their parents. My mother always buy this kind of food, one student told other member of the group. There was a difference in what type of product they try to obtain. All groups decided what to buy and then paid for them. How much change did they get? Wow, we've left so much money. Oh, no, we're going to lose the game. The students filled the classroom with their cheerful remarks. Then, they found that one group got change of 640 yen. You made it ! They told members of the group. However, the game was not over at this moment. It would continue and from here it could be a more enjoyable and important part of the game. What the students did next was to find how much garbage was produced, to check it up with a list of disposal cost and to sum up the waste disposal cost. When the students separated garbage from what they bought, they were surprised at the amount of garbage. They paid their money for the garbage disposal. After that, the group which left money most became a winner of the game. We're in the red because we cannot afford to pay disposal cost, a group said disappointed. They all discovered that the disposal cost of waste was greater than they expected and were surprised at the results. During a break, the students gathered around the shop and review the shopping that they'd just done. One student touched the garbage on the table and found that there were two types of cellophane. At the next class, the students discussed how they were able to reduce the amount of waste. There were a lot of ideas and opinions of the students learned from the shopping game. We can use our own shopping bags. You'd better to refrain from items in a plastic tray. We should purchase refilled goods or recyclable items. People should try not to buy excess packaged goods. Concerning waste disposal, some students raised their opinions which included that people should reduce non-burnable garbage since space to bury waste was being limited, or people need to refrain from items wrapped in cellophane which may produce dioxin in the process of being burned. Another idea was that for recycling, canned goods were better than PET bottled products because it was easier to recycle cans than PET bottles. In addition, we could hear novel ideas of some students. If you carefully use cellophane to wrap, you can use it many times. How about making edible packaging materials? Shopping related with the global environment. After the discussion, the project team delivered a message that as they learned from the shopping game, our daily lives were deeply related with the global environment. At the end of the class, some students expressed their views. Now, I am eager to help the earth because the global environment is worsening. So far I've always bought lower-priced goods, but from now on, when I buy something, I will care more about the environment. The lesson seemed to deeply sink into the students' hearts. We, members of the project team reflect that students' attitudes towards the environment are greatly affected by adults' behavior. It is easy to say that you should protect the environment like a slogan, but unless adults live up to those words, they cannot teach children about the environment and how to recycle. Adults should be aware of the importance of the environment and take some action. We also learned from the class that children had a wonderful idea to protect the environment, and with such children we can cope with the environmental problems in a more flexible manner. In the future, we anticipate that the environmental problems will be more serious. In order to bridge the next generation with a lot of hopes, such environment education program is indispensable. Finally, we would like to express our heartfelt gratitude to all teachers who accepted our project and let us give the special class, and also to all students who joined our class and enjoyed it.